Fyre Festival, two words now synonymous with millennial excess and music festival failure, is in the news once again. This time, however, it’s because someone has stepped in to put out the raging tyre fyre the festival has become. In a bit of savvy marketing, Ontario’s WayHome Festival has announced plans to offer free passes to its event for Fyre Festival ticket holders. WayHome is essentially throwing a life-preserver to those left stranded by the ridiculously ill-equipped team behind Fyre. “We will honour each ticket bought to the cancelled 2017 FYRE Festival with one free General Admission full-weekend ticket to WayHome 2017,” the festival’s statement reads in part. “At WayHome we cannot promise swimming adventures with pigs or fancy yachts, but we can help to fill a void & provide an experience to those who were unable to have the time-of-their-life at FYRE.” Though WayHome won’t have the gourmet food or lavish accommodation offerings that Fyre frankly didn’t have either, the festival does say they’ll at least have a beach this year — and a festival run by professionals instead of con-artists. And while it doesn’t feature Fyre’s promised lineup of G.O.O.D. 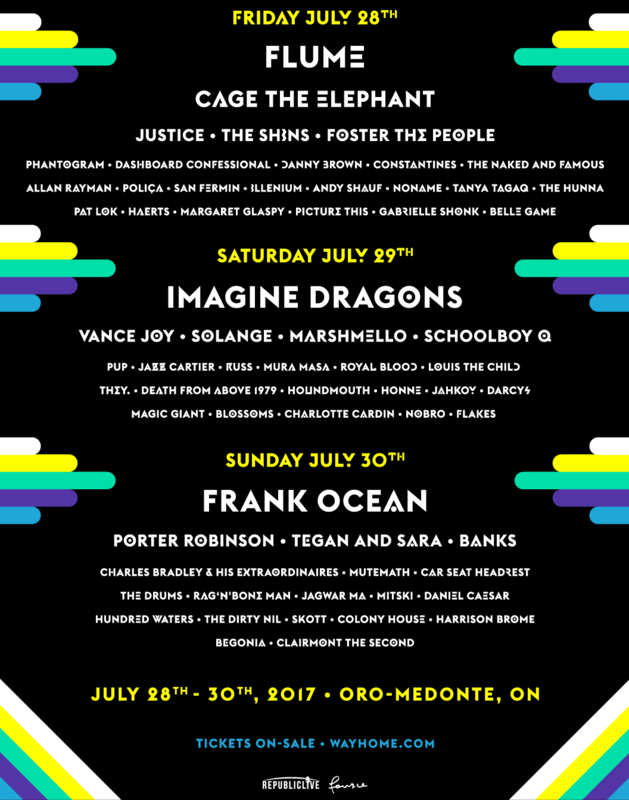 Music, Major Lazer, Blink-182 and Disclosure, WayHome does boast a lineup featuring Frank Ocean, Flume, Justice, ScHoolboy Q, and more. For their part, organizers of the ill-fated Fyre Festival have offered ticketholders free entry to next year’s attempt in lieu of refunds. Despite being greeted by a staff-less, half-built festival site filled with feral dogs and being fed slices of cheese with white bread, a vast majority of the ticket holders apparently expressed interest in giving co-founders Ja Rule and Billy MacFarland a second chance in 2018. Still, not everyone is happy/stupid enough to keep their faith in repeat fraud MacFarland, as a $100 million class-action lawsuit was also filed against the Frye Festival organizers. Update: WayHome is also offering free passes to ticket-holders of the canceled Pemberton Music Festival.